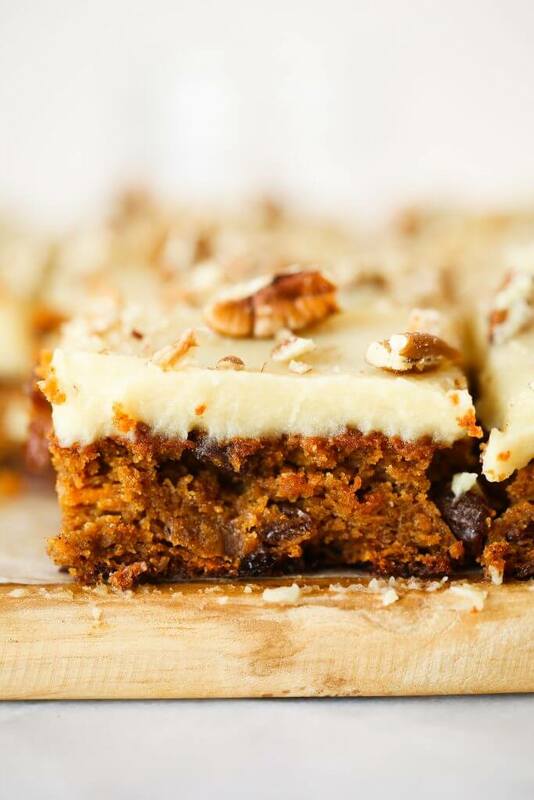 Paleo carrot cake made with sweet potatoes instead of flour. 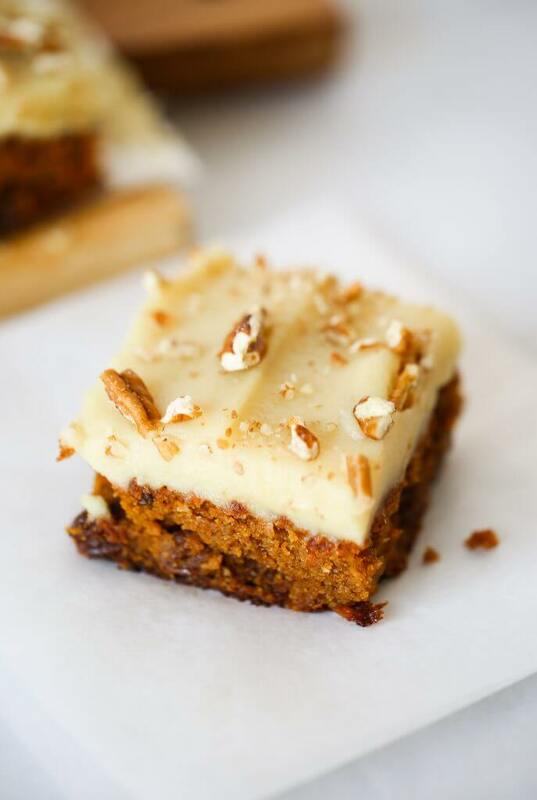 159 calorie gluten free carrot cake. This cake is so delicious you won’t even know it’s healthy! Whipped lemon frosting is also made from sweet potatoes! 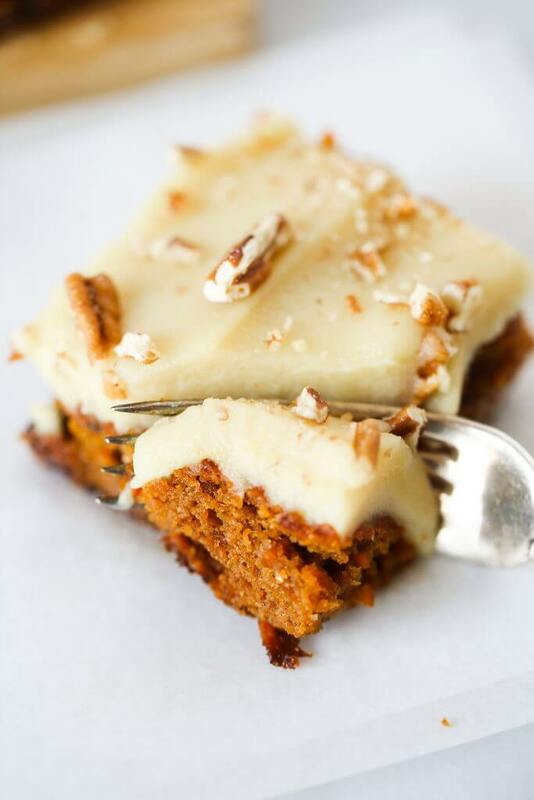 Ohhhhh, all the carrot cake. You don’t even know what kind of yumminess you are in for. It’s no secret that I love baking with sweet potatoes instead of flour. 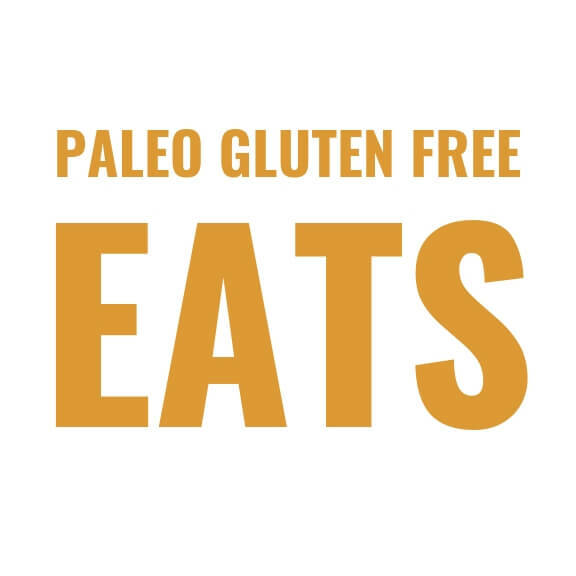 I fed this to my non-paleo people and they all went crazy for it, so I think it’s safe to share here? This week has been jam packed! Aside from getting back from a family reunion out of state, it just seems like work keeps piling up around me, a.k.a trying to swallow me. I just need a few days to get back into the groove of things and GET IT DONE. 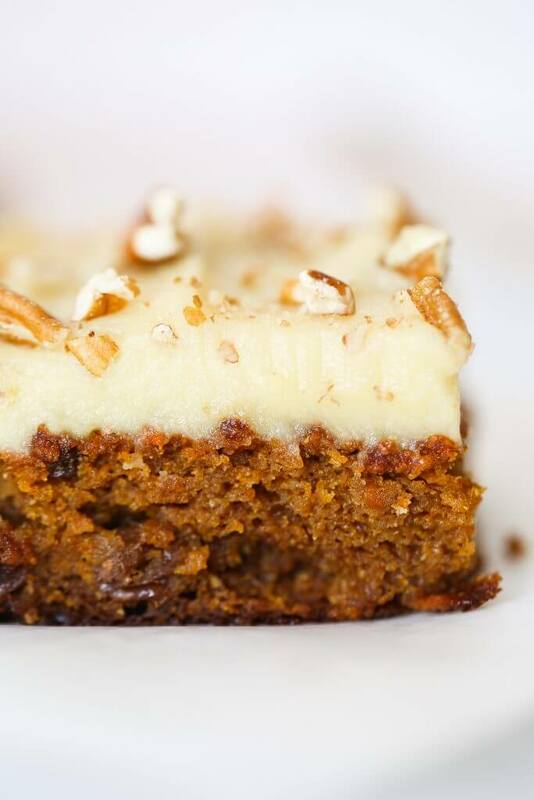 All of that is a good excuse for more carrot cake, am I right? In fact, I’ll pretty much use any excuse for more carrot cake in my life. I’m just a basic fan of the stuff. Was I the only kid who used to despise and shudder at the thought of carrots in my cake? Like, that was health food; serve it to mom my, because I am here for chocolate. Before even attempting carrot cake, I would go for all the other cakes laid out on the table when there was a celebration… or just a reason to eat cake. I would eye the chocolate or vanilla waaaay before the carrot cake. Desperate times call for desperate measures though, and sometimes there was no other option. So, I would have to resort to carrot cake, which my seven year old self was less than thrilled about. The crunchy pecans and the thought of veggies in my cake was just about as appalling to as trying to mix my foods at the dinner table. And I didn’t eat another bite of carrot cake for a very very very long time. Flash forward years later, and I’m advocating for carrot cake, because I can’t get enough of this good stuff! 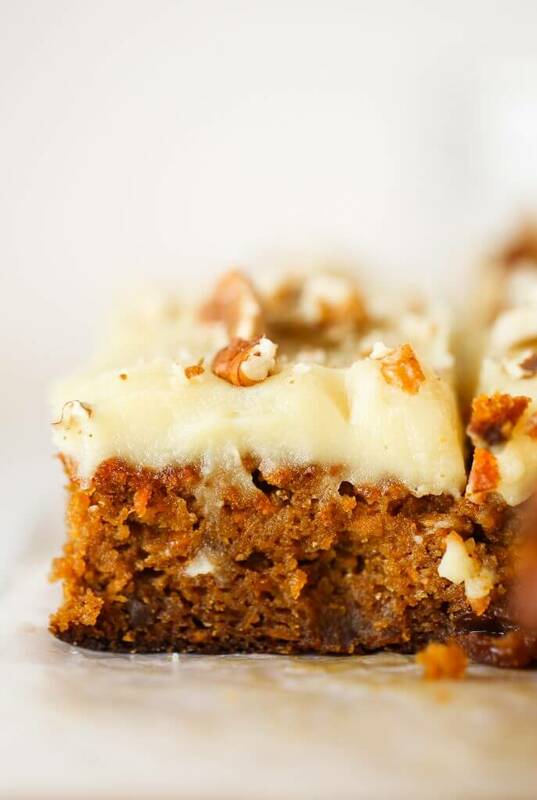 The reasons I hated carrot cake back as an anti-veggie-pecan-cake-lover seven year old are the exact same reasons why I fell in love with it years later. Come on, the crunchy pecans and veggies in cake, who doesn’t love that??? I might of been crazy then, but now I think I have made up for it. P.S. this is the baking dish I used in this recipe. 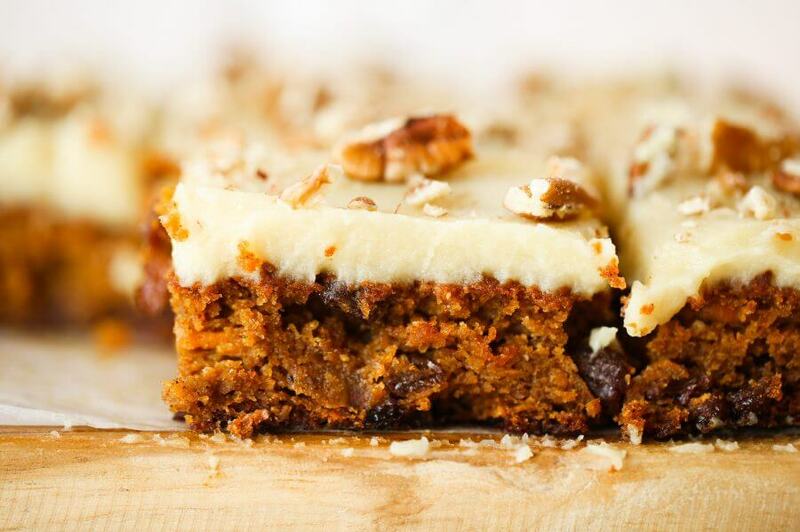 Paleo carrot cake made with sweet potatoes instead of flour. 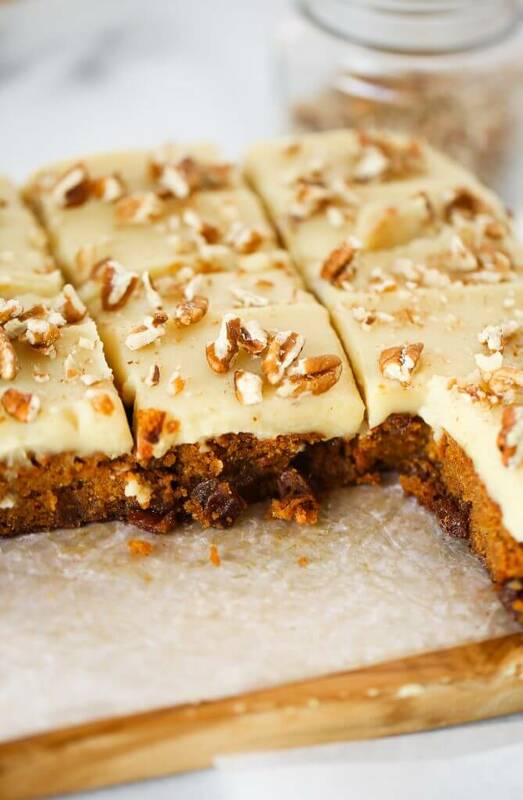 159 calorie gluten free carrot cake. This cake is so delicious you won't even know it's healthy! Whipped lemon frosting is also made from sweet potatoes! Preheat oven to 350F. Line the bottom of a 8" square baking dish with parchment paper. In a food processor, mince sweet potato until it reaches a fine rice-like consistency. Then add rest of ingredients (except raisins and carrot). Blend for about 1 minute until smooth. Then stir in grated carrot and raisins. Pour batter into 8" square cake pan lined with parchment paper and bake on 350F for about 70 minutes until golden on top. You will know it is finished cooking when a knife inserted into the center of the cake comes out clean. Peel and cut sweet potato for the frosting. Place in a small saucepan with about 1-2" water and cover with a lid. Steam for about 5-10 minutes until soft when poked with a fork. Add steamed sweet potato and rest of ingredients for frosting to food processor and puree for 3-5 minutes until completely smooth. Optional: after pureed, press frosting through a strainer to remove any lumps of remaining lemon zest flakes for a totally smooth result. Chill frosting in freezer in a large metal bowl for about 15+ minutes or until it reaches buttercream frosting consistency and is cooled down. Frost cake as desired and top with chopped pecans (optional, but delicious). I’m looking forward to making this! Is there any sub for the white sweet potato in the frosting? White Sweet potatoes are rare to come by where I live! Sounds great, thank you Ashleigh! Followed the recipe to a “t” and found that the cake was not fully cooked through even through the top was very crispy. Had to put back into the oven for some more time. Next time, will increase heat to 375 F and bake for 70mins and possibly add more flour as it had a very “wet” consistency. Can I substitute another flour for the tapioca flour? Hi Kaylie Loving the list of ingredients you have for this cake. Yet a little dubious in the selection of a “medium sized sweet potato”. Reason for this is due to personal experience. I live in Australia but have family in Hong Kong & China, as thus have experienced that sizing is relative to the country’s set standards. That is, what’s deemed as small in Australia (ie under 200gm) is interpreted as mini in HK &China. Whereas 200-600gm is average or medium in Australia but not so for my oversea relatives. So about how much weight would you consider a medium sweet potato suited for this recipe? Hi M, it’s probably around 315gm. Hi Em, I would say probably around 315gm. This recipe looks amazing and exactly what i was looking for! But when i see the ingredients listed like this – ‘medium size sweet potatoe’, half a cup of anything etc, i feel so exasperated. I know that these measurements might produce just about any consistency, just about any taste… meaning, i have to do the cake once to figure out what is wrong that i am doing so that i can correct it for the next time. It would sooooo good of you if there were any scale measurements provided… thanks in andvance! Hi Anja, I will keep that in mind and try and add that to future recipes. Thank you! Is there anything I could use instead of the white sweet potato as the base of the frosting? I live in a rural area where white sweet potatoes are never to be found! So you use a raw sweet potato, right? Can this be made with cassava flour or a different flour that’s not nut based? Hi Kristin, my best bet would be trying this recipe with oat flour, if you can’t do nuts. Could you make this into cupcakes? How long would you bake and at what temp? This recipe looks great!! However, I’m allergic to eggs so I was wondering if you had any recommendations for a good substitute. Thank you!! Hi Abby, I haven’t tried making this cake with an egg sub- I have a feeling it would be really wet! Just finished baking! So so good! I subbed arrowroot flour for tapioca flour and it turned out perfect. I didn’t make the frosting because I couldn’t find white sweet potatoes. I just topped it with whipped coconut cream instead. Although my 5 year old and I like it just fine without any frosting at all! It does have a great “spicy” hint from the ginger. Next time I may cut back just a touch on the ginger to tone it down. This was soooo good! Thank you so much for this recipe!